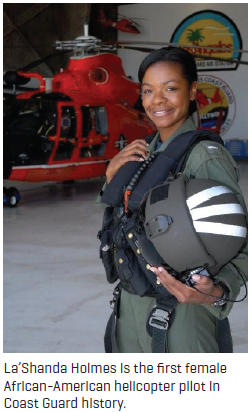 La’Shanda Jones— now a 27-year-old MH-65 Dolphin Helicopter pilot—is a pioneer: the first female African-American helicopter pilot in Coast Guard history. Linda Brown has fostered children for 30 years—307 children, to be exact. When Brown took in 16-year-old La’Shanda Jones, she never expected the teenager would become such a success, let alone a pioneer in her field. And Jones— now a 27-year-old MH-65 Dolphin Helicopter pilot—is a pioneer: the first female African-American helicopter pilot in Coast Guard history. As a seasoned foster mother, Brown has seen and heard every horror story, but the resilience of young Jones was rare. At the age of two, her biological mother committed suicide. Shortly after, Jones was adopted. However, the adoptive home soon became abusive, and she was placed into the foster care system. From then on Jones faced a tumultuous upbringing consisting of weeklong stays with families and group home living until she met the Browns. The arrangement with the Browns was still relatively new when Jones attended the historically black female university Spelman College. She was introduced to the United States Coast Guard by accident. While participating in a career fair, Jones took pity on the U.S. Coast Guard booth with few visitors. When she walked over to thank Senior Chief Dexter Lindsey for coming to Spelman, she was introduced to the benefits of the military. Jones says she never considered joining but the promise of tuition assistance sealed the deal. From then on, Jones devoted her time studying everything related to the U.S. Coast Guard. At first, she had to sell the idea of the military to her new family, but they eventually grew to share her love. Originally, she did not think aviation was her field. But after meeting her mentor, the first female African-American pilot of the fixed-winged C-130 Hercules, Lt. Jeanine Menze, she wanted to succeed as a pilot. To be an officer in the U.S. Coast Guard, candidates must make it through four months at Officer Candidate School (OCS) and roughly two years of flight school in Pensacola, Florida. On April 9, 2010 Jones graduated from flight school at the Naval Air Station Whiting Field. Being a female in the U.S. Coast Guard is a difficult role because it is comprised of predominately white males, said Jones. However, women like her are making great strides to close the gaps. Currently the Coast Guard’s first female pilot, Vivien Crea, serves as vice admiral, which is the second highest ranking in the U.S. Coast Guard. Likewise, Jones is currently stationed at the Los Angeles Air Station where six females work and the third in command is female, Lt. Commander Elizabeth Booker. On May 7, 2012, Jones was promoted to lieutenant and received double silver bars. Jones and Lt. Menze are now in the company of other minority women flying aircrafts in the Coast Guard, like Jessica Davila, the branch’s first Latina helicopter pilot. Yet what keeps Jones going isn’t the fact that she made U.S. Coast Guard history. Instead, it’s the dignity of her missions. At the end of the day, though, she looks forward to coming home to her best friend and husband, Jamal. Wonderful, just wonderful. BLACK LIVES STILL AND WILL FOREVER MATTER.